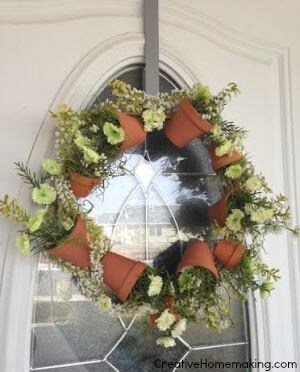 This is a fun, easy clay pot wreath that you can make in an hour or so. It is fairly in expensive too. I bought most of the supplies at a local Dollar Store. I really like how the wreath turned out. To complete this clay pot wreath you will need a few simple supplies. I bought the clay pots and wreath at the Dollar Store, and most of the flowers on sale at Michael’s. You will want at least two sizes of mini clay pots for this project. At the Dollar Store I think the tiny ones come in sets of 3 for $1. 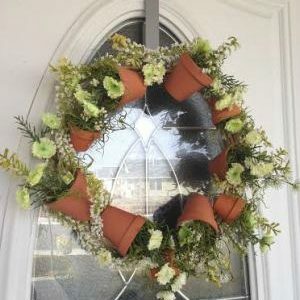 It is a little tricky to tie the pots to the wreath. I used pieces of twine and threaded them through the holes in the bottoms of the clay pots and tied them to the grapevine wreath. It’s okay if you can see the twine, you can cover it with flowers later. You might find it a little difficult to get the pots to point the way you want them to. Get them as close to where you want as possible and then use a little hot glue if necessary to hold them in place. Arrange the pots so that they are pointing in different directions. Next use a sharp knife to cut the floral foam into small pieces that will fit into each of the clay pots. After you get the foam into the pots, it’s time to start inserting the artificial flowers into the pots. Cut them to the size you need. I used three or four different shapes of flowers, in complementary colors. If necessary, use a little hot glue to hold them in place. Lastly, fill in any holes or gaps with the moss and gently hot glue in place if necessary. You can tie a ribbon or piece of twine around the top to hang the wreath but I just placed the wreath on a wreath hanger. I love how the wreath turned out, it is perfect for spring or summer.